This is the final edition of The ARRL Letter for 2011. Both The ARRL Letter and ARRL Audio News will resume on Thursday, January 5, 2012. Thanks for reading The ARRL Letter each week -- we'll see you next year! Last Man Standing -- starring Tim Allen as MIke Baxter, KA0XTT -- airs Tuesday nights on ABC at 8 PM EST. The ARRL has provided Amateur Radio materials, such as issues of QST and certificates for DXCC, WAS and WAC to the show. In this photo, Allen, as Baxter, tunes his IC-92AD handheld transceiver as his boss (played by Hector Elizondo) watches. Tim Allen -- star of Home Improvement, Toy Story, The Santa Clause and Galaxy Quest, just to name a few -- stars in Last Man Standing, an ABC comedy airing at 8 PM (EST) on Tuesday nights. Allen plays Mike Baxter, KA0XTT, a married father of three and the director of marketing at an outdoor sporting goods store in Colorado whose life is dominated by women. While Amateur Radio has not been prominently featured in the first episodes, according to John Amodeo, NN6JA -- the producer of Last Man Standing -- it is a part of the show and an important part of Mike's character. At press time, the episode that will establish Mike as a radio amateur is scheduled to air mid-January. "Tim's character Mike is involved in creating the sales strategy for the store, including their catalog and Internet identity," Amodeo told the ARRL. "The store is like Bass Pro Shops or Cabelas. There is a strong self-sufficiency overtone to Mike's approach to life. Ham radio fits in the story as a means of emergency communication. It's not directly featured in the foreground story, but at the moment, it's a background element on the home set. Once I allow something to be put on the set, there's a chance the writers will feature it. Now that we have actually established Mike Baxter as KA0XTT, we can do more things featuring Amateur Radio." Read more here. On Tuesday, December 13, the National Transportation Safety Board (NTSB) recommended that States ban the nonemergency use of all cellular telephones and other "portable electronic devices" (PEDs) by drivers of motor vehicles. This would include hands-free cell phone operation and all text messaging while mobile. While this NTSB recommendation has been the lead story in national media, the "distracted driving" issue has been receiving serious attention for several years. A number of states and municipalities have prohibited texting and handheld cellular telephone use by all or some drivers, though none has gone so far as to outlaw all hands-free cell phone use. To avoid unintended consequences to Amateur Radio operation, the ARRL has been closely involved with this issue for several years. The full text of the NTSB report is not yet available, and it is not yet known whether the broad term "portable electronic devices" might be construed as including all or some Amateur Radio equipment. On January 30, 2009, the Executive Committee of the ARRL Board of Directors approved and released an ARRL position paper on Mobile Amateur Radio Operation. In that paper, the ARRL encourages licensees to conduct Amateur Radio communications from motor vehicles in a manner that does not detract from the safe and attentive operation of a motor vehicle at all times, but points out that mobile two-way radio equipment has been in use for at least 70 years and is quite dissimilar from full-duplex cell phones. Read more here. The Middle Class Tax Relief and Job Creation Act of 2011 (HR 3630) -- the bill to extend the payroll tax reduction that passed the US House of Representatives on Tuesday, December 13 -- includes among its many other provisions the "Jumpstarting Opportunity with Broadband Spectrum Act" or "JOBS Act" that passed the Communications and Technology Subcommittee on December 1. The JOBS Act makes up Title IV of HR 3630. Read more here. 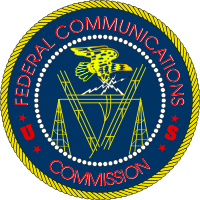 Last month, the FCC released a Report & Order (R&O) detailing new rules for the 5 MHz (60 meters) Amateur Radio band. These rules have not been published in the Federal Register. In order to be official, the rules must be published in the Federal Register and will take effect 30 days after the publication date. Any radio amateur who is operating under the new rules before this time is in violation of the current rules. The official date for these new rules will be announced on the ARRL website as soon as the information is available. 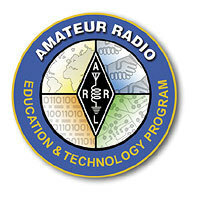 Earlier this month, the ARRL Executive Committee reviewed grant applications for the ARRL's Education & Technology Program (ETP), awarding instructional resources valued at nearly $2000 to two schools. More than 525 schools across the country have received support from the ETP in the form of equipment, curriculum and resources, as well as teacher in-service training through the Teachers Institute on Wireless Technology. Applications for equipment and resource grants are accepted twice each year; application deadlines are May 1 and November 1. A central goal of the ETP is to develop a foundation of wireless technology literacy among America's teachers and students. It employs Amateur Radio to explore radio science and electronics and provide hands-on activities that engage students' minds and imaginations, opening doorways into math, science and technology curriculum topics, as well as other core curriculum areas such as geography and language arts. Read more here. You can find additional background and a form for submitting information here. Stan Korzep, W8NNX, of Orlando, Florida, was wondering that if he improved his ground conductivity, would he also improve his radiation elevation pattern? With this in mind, he wrote to the Doctor: Late last night as I pondered why -- with 10 meters so hot -- I was not working any DX stations in the Asia Pacific region. My first thought was that the competition was too great. I still use the three element trap Yagi that was on my tower in the 1980s when I had much better luck. Thanks to my power company, I have a far field noise source that allows a pretty good check of antenna pattern, F/B and the ability to determine if there is a gain compared to my other antennas. With a pretty good SWR, and greater than 20 dB F/B, I believe that the tribander has survived three hurricanes and two decades of use quite well. The required elevation angle for a small number of F layer hops to the Pacific is quite small. I seem to recall a QST article ["The Antenna Elevation Pattern -- What's the Big Deal?" Mar 2010, pages 39-40] that noted that the elevation angle of maximum radiation was largely determined by the antenna's height. I wonder if this might be a factor in my lack of success. Since my antenna is limited to 24 feet by homeowners and county rules, the installation has not changed in 32 years -- only the results have deteriorated. The decline in the rainfall over the two decades here at my location (I maintain two rain gauges in the back yard) may have changed the apparent ground. The ground beneath my house and antenna is what the locals call "sugar sand," one step up from beach sand. Its ability to provide a good ground is akin to pure distilled water. I read some time ago about the relationship of soil fertility, carbon and soil conductivity. Will improving my ground conductivity improve my radiation elevation pattern? Your thoughts would be appreciated. 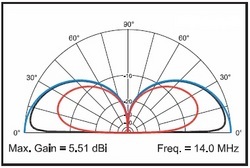 A better ground will certainly change the elevation contour of your antennas due to reflections -- in phase for vertical antennas (reinforcing the low angle radiation) and out of phase with horizontal (tending to cancel the lowest angles); however, the major impact will occur at some distance from the antenna. The exception is for vertical antennas that use the Earth as part of their ground system -- their efficiency will improve with better conductivity near the base -- independent of the reflection part of the equation. Your height of 24 feet is interesting for a tribander. That is about 0.35 wavelengths on 20 meters, just above 0.5 wavelengths on 15 and about 0.7 wavelengths on 10 meters. Over EZNEC's "Typical ground" (0.005 S/m conductivity, dielectric constant of 13), that gives the results in Table 1 below on the 10 and 20 meter bands based on my model of a similar tri-bander. The results for 15 meters will be in between. If your ground is less conductive, it will actually be better (less cancellation at low angles); however, you will not get as much reinforcement at the peak angle at which the reflection is in phase. The extreme would be the "free space" case in which there is no ground at all. There the peak is at the horizon and you have the results shown in Table 2 below. Thus, with a low horizontal antenna, the long haul performance will be better with a poor ground than with one of high conductivity. This will change as the antenna gets high enough so that the angle of peak gain gets close to the optimum angle for the distance you want to work. This angle will be quite small for few hops to the Pacific -- typically a 6000 to 10,000 mile path. As seen in Figure 1, even at 5 degrees elevation, it will take two to four hops to get there. Again, this is not the ground directly under the antenna, but the ground from which the reflection takes place, some distance away. The higher the antenna is, the further the distance to the ground that will reinforce the peak of the elevation pattern. Thanks Doctor! Do you have a question or a problem? Send your questions via e-mail or to "The Doctor," ARRL, 225 Main St, Newington, CT 06111 (no phone calls, please). Look for "The Doctor Is IN" every month in QST, the official journal of the ARRL. The high altitude balloon released by the California Near Space project traveled more than 6000 miles before it burst in the Mediterranean Sea. See a larger version here. Ron Meadows, K6RPT, and his son Lee -- leaders of the California Near Space Project -- successfully launched an Amateur Radio high altitude balloon from San Jose, California on Sunday, December 11 at 4:43 PM PST. The balloon reached a cruise altitude between 105,000 and 115,000 feet, where it continued its travel across the United States, the Atlantic Ocean and Spain and into the Mediterranean Sea. For most of its trip, the balloon traveled at about 150 miles per hour and eventually covered 6236 great circle miles in just 57 hours 2 minutes. 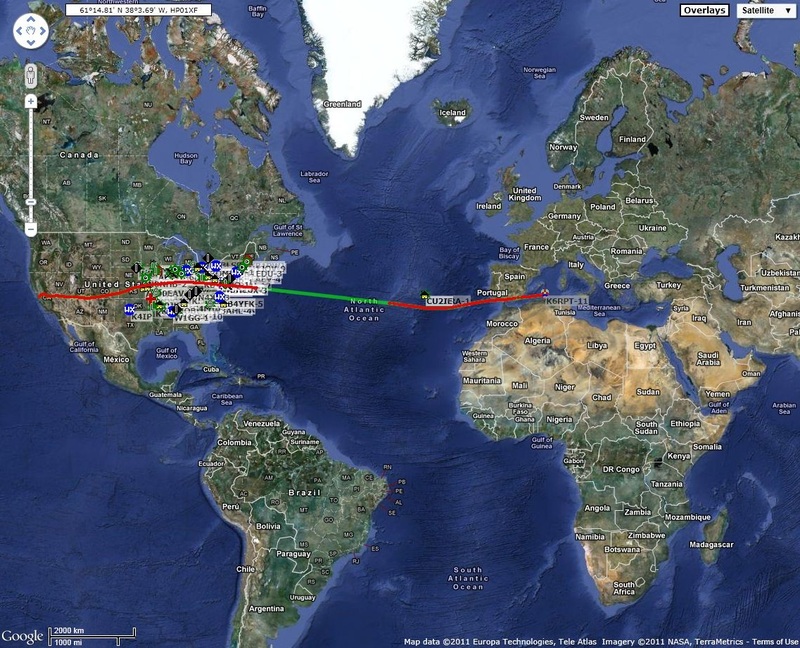 According to the CNSP, this is a new Amateur Radio balloon flight record for both distance and duration. Read more here. Paul Jacobs, W2IOG, of Naples, New York, sent us this idea for assembling small PC boards. Contact Paul via e-mail for more information. Here's a simple fixture that makes assembling small PC boards a snap. A scrap piece of 1/4 inch aluminum sheet forms a base for the fixture. Mount two 1-inch standoffs about 1/2 inch farther apart than the longest dimension of the PC board to be assembled. Now cut a piece of 1 inch thick soft foam packing material to slightly larger than the size of the board so that it fits snugly between the standoffs. Mount two crimp type insulated wire terminals to the standoffs; keep the screws slightly loose. The W2IOG PCB holder in action, keeping components in place for soldering. To use the fixture, insert several components into the board, turn both the board and the fixture vertical, press the component side of the board to the foam and return both to the horizontal position. Press down on the board to compress the foam and rotate the two wire terminals to hold the board in place. The weight of the fixture keeps the board in place and the pressure of the foam holds the components firmly to the surface of the board. Soldering them in place is easy. Do you have an idea or a simple project that has improved your operating? Maybe you've taken something commonly found around the home and developed a ham radio use for it? Why not share your hints with fellow hams in "Hints and Kinks," a monthly column in QST. If we publish your hint in QST or The ARRL Letter, you will receive $20. Send your hints via e-mail to h&k(at)arrl(dot)org or to ARRL Headquarters, Attn: "Hints and Kinks," 225 Main St, Newington, CT 06111. Please include your name, call sign, complete mailing address, daytime telephone number and e-mail address. ARRL Headquarters will be closed Monday, December 26 and Monday, January 2 in observance of Christmas and New Year's Day. There will be no W1AW bulletins or code practice transmissions those days. There will be no ARRL Letter or ARRL Audio News on Thursday, December 22 and 29; both the Letter and Audio News will return on January 5, 2012. We wish everyone a safe and joyful holiday season and a prosperous 2012. 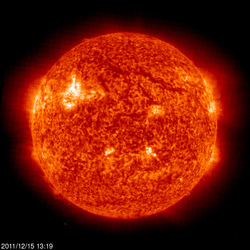 The Sun, as seen on Thursday, December 15, 2011 from NASA's SOHO Extreme Ultraviolet Imaging Telescope. This image was taken at 304 Angstrom; the bright material is at 60,000 to 80,000 Kelvin. Tad "Sunshine, go away today" Cook, K7RA, reports: Solar activity dropped this week, with the average daily sunspot numbers declining more than 39 points to 94.7. It's been 13 weeks since the average daily sunspot number for the week was that low or lower, when we reported an average of 91.7 in the September 16 edition of the Solar Update. The latest USAF/NOAA forecast has the solar flux for December 15-17 at 130, 128 and 126, then 125 on December 18-22, then 150 on December 23-26, 140 on December 27-28, and then 145 on December 29-January 4. The predicted planetary A index is 8 on December 15, 5 on December 16-25, and 8 on December 26-29. Geophysical Institute Prague predicts quiet conditions December 16-18, quiet to unsettled December 19, unsettled December 20 and quiet December 21-22. Look for more information on the ARRL website on Friday, December 16. For more information concerning radio propagation, visit the ARRL Technical Information Service Propagation page. This week's "Tad Cookism" is brought to you by Jonathan Edwards' Sunshine (Go Away Today). Many ARRL members with arrl.net e-mail accounts have recently received bogus e-mails in a "phishing" attack. These are scams designed to scare people into e-mailing back personal information -- such as user names and passwords -- to the scammer at an unknown address. This particular attack was more sophisticated than usual, but far from unique. "There is never a time when we would ask via e-mail for user names and passwords of arrl.net users," explained ARRL IT Manager Michael Keane, K1MK. "There is simply no need to ever do so. If you receive an e-mail asking for personal information and it looks like it originated from ARRL, please do not respond. The best thing you can do when receiving bogus e-mails is to simply add it to the spam list in your computer's e-mail program and delete it. Please don't forward it to ARRL HQ -- we will have already seen it and are already responding to it." ARRL members -- and anyone who uses e-mail services -- should be constantly aware that e-mail is far from secure. If anyone ever asks you for personal information via e-mail, it probably is a scam, no matter how pretty or professional their logo or graphics may appear.